Bibbs had one carry for two yards and three receptions for 13 yards in Sunday's loss to the Lions. 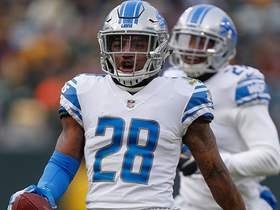 Analysis: Bibbs saw action for the first time as a Packer and, with Aaron Jones (knee) out, worked as the backup behind Jamaal Williams. 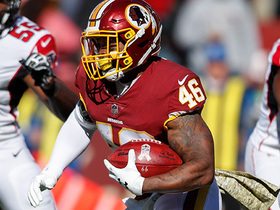 Bibbs suited up for two games with the Packers and 10 with the Redskins in 2018, and finished with 21 carries for the second year in a row. It remains to be seen if he will be back with the Packers in 2019, but if he is, he will compete for the No. 3 spot on the depth chart behind Jones and Williams. Bibbs was claimed off waivers by the Packers on Monday. Analysis: Bibbs was waived by the Redskins over the weekend and didn't have to wait long before joining a new team. The 25-year-old could quickly find himself as the No. 2 running back behind Jamaal Williams as starter Aaron Jones is nursing an MCL injury, though the severity of the issue has yet to be disclosed. Bibbs had 20 carries for 101 yards and three touchdowns in 10 games before parting ways with Washington. Bibbs was released by the Redskins on Saturday. Analysis: It's a bit of a surprise to see the Redskins jettison Bibbs, but the move likely indicates Chris Thompson is finally healthy after missing multiple weeks earlier in the year with a ribs injury. The move also opens the door for unheralded third-year running Byron Marshall to see some time in the event Thompson is unable to handle his usual workload. Bibbs (coach's decision) is listed as inactive Sunday versus the Giants, Kareem Copeland of The Washington Post reports. Analysis: Bibbs is in street clothes for the first time since his promotion to the 53-man roster on Sept. 22, the best indication the Redskins are confident Chris Thompson is back to full health. As long as Thompson and Adrian Peterson are game-ready, Bibbs likely will be a healthy scratch on gameday. Bibbs took one carry for no gain and caught two of three targets for six yards in Sunday's 23-21 loss to Houston. Bibbs played 24 of 58 snaps on offense in Sunday's 16-3 win at Tampa Bay, taking three carries for 28 yards and catching two of four targets for 13 yards. Analysis: Bibbs continued in his role on passing downs with Chris Thompson (ribs) out for another week, while Adrian Peterson piled up 21 touches on 34 snaps. Bibbs has been a competent replacement, but the passing-down role doesn't demand touches unless Thompson is in the lineup. It's unclear if Thompson will make it back for Week 11 against the Texans. Bibbs took three carries for 20 yards and a touchdown and caught his only target for a 15-yard gain in Sunday's 38-14 loss to Atlanta. Analysis: Bibbs filled in for Chris Thompson (ribs) on passing downs, playing 21 of 69 snaps (30 percent) on offense and hitting paydirt for the third time this season. 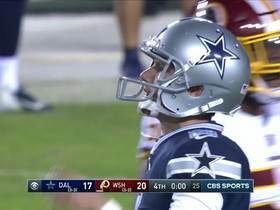 He then missed out on an opportunity to pad his stat line in garbage time, as Washington turned to Samaje Perine for the meaningless final drive. Bibbs has some deep-league appeal for a Week 10 matchup at Tampa Bay, but only if Thompson is forced to miss another game. Bibbs (shoulder) is listed as active Sunday versus the Falcons, Kareem Copeland of The Washington Post reports. Analysis: The Redskins ruled out Chris Thompson (ribs) and entered the weekend with Bibbs listed as questionable. After opting not to activate fellow running back Byron Marshall (knee) from injured reserve Saturday, Bibbs' odds to play just a week removed from suffering a separated shoulder improved. However, who will spell Adrian Peterson between Bibbs and Samaje Perine remains to be seen. Bibbs (shoulder) is listed as questionable for Sunday's game against the Falcons, Kareem Copeland of The Washington Post reports. Bibbs (shoulder) is listed as a limited participant at Wednesday's practice. Bibbs suffered a separated left shoulder during Sunday's 20-13 win against the Giants, Les Carpenter of The Washington Post reports. 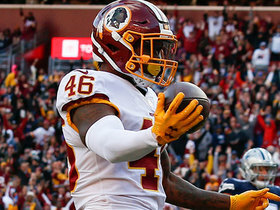 Analysis: Washington's backfield had the services of Chris Thompson on Sunday for the first time since Week 5, relegating Bibbs to one offensive snap and 10 on special teams. There's little doubt Bibbs will be listed on the injury report this week, but even if he continues to suit up on gamedays, there's not much room for him to receive touches behind Adrian Peterson and Thompson. Bibbs carried two times for 13 yards while adding four catches for 43 yards and a touchdown during Sunday's 20-13 win over the Cowboys. Bibbs took two carries for 11 yards and caught one of two targets for six yards in Sunday's 23-17 win over Carolina. Analysis: Bibbs played 26 snaps on offense with Chris Thompson (ribs/knee) unavailable, but the playing time didn't actually translate to touches. Given that he was a game-time decision, Thompson may be able to return for Week 7 against Dallas. Bibbs is expected to fill in for the inactive Chris Thompson (ribs/knee) on Sunday versus the Panthers, Kareem Copeland of The Washington Post reports. Analysis: Bibbs will have to contend with workhorse back Adrian Peterson for carries, but there should be plenty of volume available in the passing game with Thompson and Jamison Crowder (ankle) on the sideline. 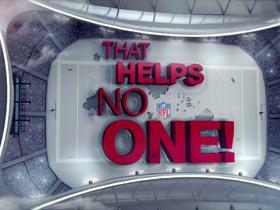 In five appearances with the Redskins, Bibbs has hauled in 14 of 17 passes for 128 yards and one touchdown. Bibbs was promoted to the Redskins' active roster from their practice squad Saturday, John Keim of ESPN.com reports. Analysis: Bibbs will be No. 4 on the depth chart at running back, so it is unlikely he will get much run there. His primary role will likely be on special times for the time being. Bibbs has a spot on Washington's practice squad, Les Carpenter of The Washington Post reports. Analysis: Bibbs had 100 scrimmage yards in Week 17 last year and picked up 225 yards on 26 touches this preseason. It wasn't quite enough to earn a spot on the 53-man roster, with the Redskins opting for Rob Kelley and Samaje Perine to fill out the depth chart. Bibbs could be next in line for work on passing downs if Chris Thompson suffers an injury at any point during the season. The Redskins let go of Bibbs on Saturday, Ian Rapoport of NFL Network reports. Analysis: The arrival of Adrian Peterson in Washington spelled doom for those on the fringes of the backfield. Bibbs will be the first to go but won't be the last as the Redskins finalize their remaining cuts. With just 50 carries and 16 receptions in 16 career games, he may find it difficult to find a landing spot. Bibbs improved his case for a roster spot in Thursday's preseason loss to the Ravens, John Keim of ESPN.com reports. Analysis: Bibbs only took two carries for 11 yards, but he did strong work as a pass blocker and picked up 41 yards on three receptions. With Chris Thompson bouncing back from a severe leg/ankle injury, Washington may value Bibbs' pass-catching ability over whatever Samaje Perine or Rob Kelley has to offer. One of the three likely will be released within the next few days. Bibbs took two carries for 41 yards and caught two of four targets for 20 yards in Friday's preseason game against the Broncos. 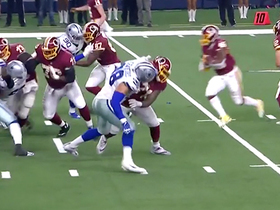 Analysis: With Chris Thompson (leg) still being held out, Bibbs operated as the passing-down back for the starting offense. Thompson is expected to be ready for Week 1, but it won't come as any surprise if Bibbs sticks around on the 53-man roster as a form of insurance. The other Washington running backs -- Adrian Peterson, Rob Kelley and Samaje Perine (ankle) -- don't offer much in the passing game. Bibbs has quietly piled up 173 scrimmage yards in three preseason games. Bibbs gained six yards on five carries and 47 yards on seven receptions (eight targets) in Thursday's 15-13 preseason win over the Jets. Bibbs (knee) gained 48 yards on four carries and 11 yards on one reception in Thursday's 26-17 preseason loss to the Patriots. Bibbs is listed as day-to-day with a knee contusion, Kimberley A. Martin of The Washington Post reports. Analysis: The fact that Bibbs is considered day-to-day likely means that the injury isn't anything too serious. However, the tailback will need to get back on the field sooner rather than later, considering he's battling three other running backs for what may be just one open spot on the Redskins' final roster. Bibbs (undisclosed) has been practicing at training camp, Rich Tandler of NBC Sports Washingtton reports. Analysis: Bibbs missed part of the offseason program with a soft-tissue injury, but there was never any indication he'd be in danger of sitting out training camp. He's competing with Rob Kelley, Byron Marshall and Martez Carter for what may be only one roster spot. Bibbs (undisclosed) may need to beat out Rob Kelley (ankle) for a roster spot, Rich Tandler of NBC Sports Washington reports. Bibbs sat out Wednesday's practice with a soft-tissue injury, Kimberley A. Martin of the Washington Post reports. Analysis: The exact location of the injury is still unclear, but the expectation is it's minor and that Bibbs should be back to practice at some point next week. Bibbs filled in with significant carries over the last few games of the 2017 campaign, but is expected to be a bit buried on the depth chart heading into training camp with first-round selection Derrius Guice in the fold, as well as guys like Samaje Perin, Chris Thompson (leg) and Rob Kelley (ankle). Bibbs carried 12 times for 47 yards and caught eight of nine targets for an additional 53 yards during Sunday's 18-10 loss to the Giants. Bibbs ran the ball seven times for 26 yards and hauled in two of four targets for 28 yards on 33 offensive snaps in Sunday's win over the Broncos. Analysis: In just his second game with the Redskins, Bibbs essentially split the starting running back load with Samaje Perine, who suffered a groin injury Thursday in practice. Bibbs could see even more reps in Sunday's season finale against the Giants, as the Redskins may be more inclined to give their young talent the spotlight with no postseason opportunity in the balance. Bibbs will have to contend with an active Samaje Perine (groin) for touches Sunday against the Broncos, Rich Tandler of NBC Sports Washington reports. Analysis: Bibbs likely won't slot in as the clear No. 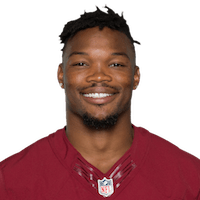 1 running back on the Redskins roster, but snaps should be readily available after Perine injured his groin in practice Thursday. What Bibbs is able to do with an increased workload remains to be seen. Having said that, in the nine games in which he's received a touch in his career, Bibbs has averaged 4.4 YPC and gathered in six of eight passes for 122 yards and two touchdowns. Bibbs may replace an injured Samaje Perine (groin) as the Redskins' starting running back for Sunday's game against the Broncos, Matthew Paras of The Washington Times reports. Bibbs rushed twice for six yards and caught all four of his targets for 47 yards and a touchdown in Sunday's 20-15 win over the Cardinals. Analysis: Just called up off the practice squad, Bibbs showed excellent receiving chops out of the backfield. The highlight of his day came on a 36-yard touchdown catch in the second quarter. Given how much success quarterback Kirk Cousins had throwing to receiving back Chris Thompson (knee) earlier this season, Bibbs should be on the fantasy radar for next week's home clash with the Broncos, especially in PPR leagues. The Redskins promoted Bibbs from the practice squad Tuesday, Stephen Czarda of the team's official site reports. 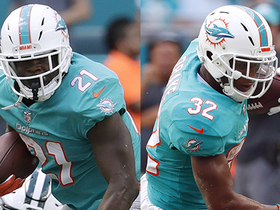 Analysis: The backfield is down yet another member with the placement of Byron Marshall on IR due to a hamstring injury. Due to his track record in Denver -- 29 carries for 129 yards and two catches (on four targets) for 79 yards and one touchdown last season -- Bibbs is likely the preferred option to back up No. 1 RB Samaje Perine (illness). However, Bibbs may have to compete with LeShun Daniels for those reps. At the very least, Bibbs will provide depth at kick returner. Washington Redskins running back Kapri Bibbs dives in for a rushing touchdown from 1-yard out. 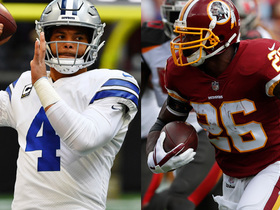 NFL Network's "NFL Fantasy Live" crew previews the Thanksgiving matchup between the Washington Redskins and Dallas Cowboys in Week 12. 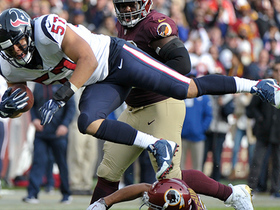 Houston Texans linebacker Brennan Scarlett intercepts Washington Redskins quarterback Alex Smith's pass for an 8-yard gain. 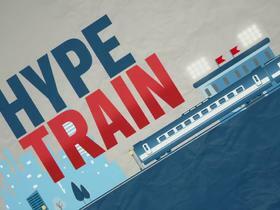 The "NFL Fantasy Live" crew discuss which fantasy players will live up to their hype in Week 10. NFL Network's Cynthia Frelund takes a closer look at the numbers and explains which running back you should target stuck in a committee. Washington Redskins running back Kapri Bibbs dances outside for a 3-yard touchdown. Washington Redskins running back Kapri Bibbs turns on the jets to speed past defenders for a 23-yard touchdown run.